HowMechanismWorks ? : What Is Traction Control System & Why We Need It? What Is Traction Control System & Why We Need It? Traction Control Works in the background to help accelerate and prevent wheel slippage (or “over-spinning”) when driving on slippery surfaces.It stops wheel spin by reducing engine power or temporarily applying the brakes to that wheel, allowing the car to accelerate smoothly, even on slippery surfaces. Limited slip differentials also help provide a more even distribution of traction forces when the car is on a slippery surface. This feature provides a lot of benefits to drivers, from making driving smoother to helping them stay in control of the car on icy roads or during rainy weather.Almost all super bikes and cars nowadays are using a traction control system to maintain an excellent stability and also to provide better safety.In general, a traction control system is identical to some of the commonly and widely used electronic systems in vehicles today like ABS brakes, fuel injection systems and damping control system which uses micro controllers. It can be also called in many other names like ESC (Electronic Stability Control) ESP (Electronic Stability Program) VSA (Vehicle Stability Assist) etc depending on the brand of a vehicle. 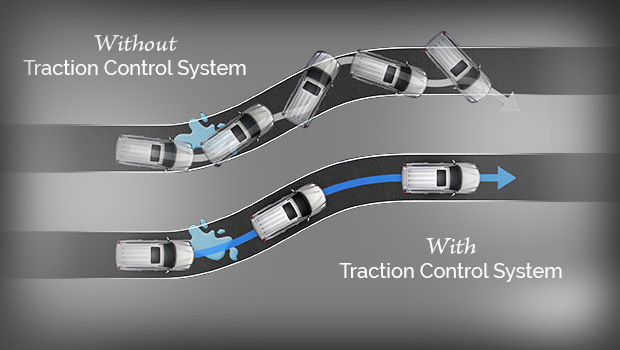 Why We Need Traction Control System ? Cars are usually equipped with high power engines which delivers instant power to the wheels to spin and move on. So when a situation like starting from halt to accelerate instantly and slowing down during cornering and accelerating again, there may a chance of wheel slip between the road surface and the vehicle. In bikes, the contact surface of tyres during cornering are not the same for both front and rear tyres. All these situations may lead to loss of stability & ultimately leading to an accident. To avoid these we need traction control system. Traction control works with the ABS system, but serves a different purpose. While the ABS system kicks in when you’re trying to stop your vehicle, traction control engages when you try to accelerate.Whenever your about to stop the vehicle on a wet or snowy road. It’s your turn to go and you push down on the gas pedal. Your tires start to spin because they don’t have enough traction on the slippery pavement. Traction control begins working to slow down the speed of the tires so they get enough grip on the pavement to propel you forward. Your wheels stop spinning and your car begins to move forward. This is traction control in action.